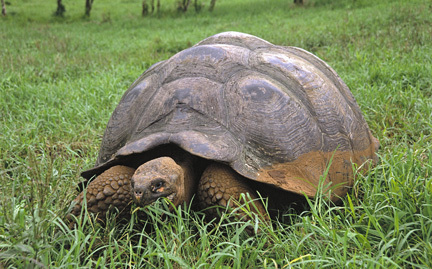 The largest living tortoise, Galapagos tortoises are endemic to the Galapagos Islands, off the coast of Ecuador in South America. With an estimated average life-span of 150 to 200 years, only about 15,000 remain due to hunting for food during the 18th and 19th centuries. Hunting of the tortoise is now prohibited, but its eggs are threatened by introduced species such as rats and cats.